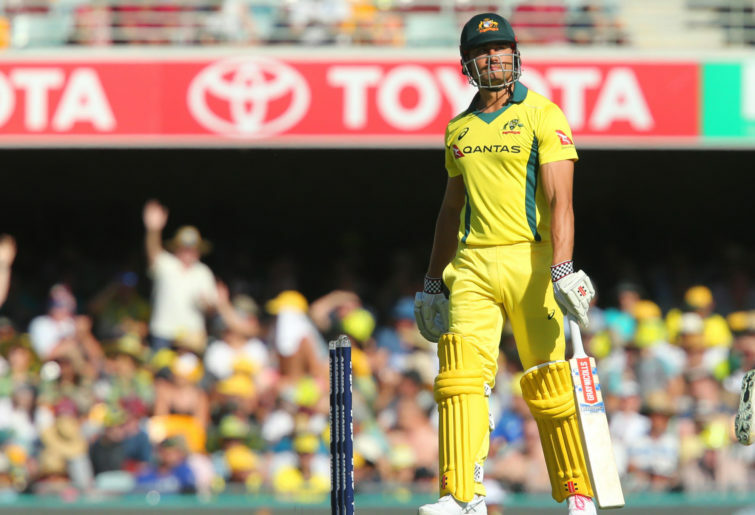 Australia’s six-match ODI winning streak, which continued with a dominant victory against Pakistan yesterday, has helped mask the worrying batting form of all-rounder Marcus Stoinis. Over the past year, Stoinis has made just 391 runs at 28 from his 18 ODIs. While such figures could be forgiven if they were owned by fellow all-rounder Glenn Maxwell because of his extraordinarily high strike rate, Stoinis has been scoring very slowly at just 4.92 runs per over in that time. This scoring rate is too gentle even for a top-order anchor batsman, let alone for a player in Stoinis who is meant to be Australia’s second power hitter in the middle order alongside Maxwell. With Australia’s number seven, wicketkeeper Alex Carey, already proven to lack hitting power late in an ODI innings, Stoinis’ snail-paced batting is leaving the Australian line-up poorly balanced. At present, the responsibility to up the ante late in Australia’s innings is resting entirely on the blade of Maxwell. A well-balanced ODI team will have at least two players batting between five and eight capable of scoring say 40 from 30 balls, as Maxwell does so comfortably. Stoinis is meant to be such a player but, instead, consistently has been getting bogged down early in his ODI innings. To emphasise this point, consider this stat: He has reached 30 balls faced in seven ODI innings over the past year. These are the number of runs that he had at the 30-ball mark of those innings: 10, 12, 18, 19, 21, 24 and 38. Which means that only once in 18 ODIs over the past year has Stoinis reached 30 balls faced at anything other than a slow pace. Further damning is Stoinis’ strike rate for between 1-30 balls faced across all his ODI innings in the past year. It is 69. That is awfully low for a batsman who is tasked with being dynamic. Australia already have plenty of batsmen who are tasked with building an innings – which can at times require a slow start – in Aaron Finch, Usman Khawaja, Shaun Marsh and Steve Smith. They do not need another slow starter, which is just what Stoinis has become. He relies on trying to make up for these leisurely starts by accelerating once he is well set. But such an approach is a luxury a middle-order ODI batsman can only afford when he has lots of overs left to bat. If Australia’s top four continues to fire – and it has David Warner and Smith to bolster it soon – then Stoinis more often than not will be coming to the crease in the final 15-20 overs needing to score briskly from the get-go. While Australia are travelling nicely now, they may find themselves needing to score 330-plus in a do-or-die match in the World Cup, given England has been by far the highest scoring venue for ODIs over the past four years. In such a scenario they need middle-order batsmen capable of arriving at the crease and wasting few balls. Such middle-order batsmen need to be on 30, at a minimum, after facing 30 balls not bogged down on 15-20 like Stoinis is consistently at present. Due to Australia’s logjam of ODI batting options, there has been a lot of speculation about which players out of Smith, Warner, Mitch Marsh, Khawaja and Peter Handscomb may be squeezed out of the World Cup XI. Yet it is Stoinis who deserves to be most vulnerable right now. Of course, dropping Stoinis would have knock-on effects. It would mean that Australia would need to get ten overs out of Glenn Maxwell and rank part-time spinners like Aaron Finch and Maxwell. Or it would require them to replace Stoinis with another all-rounder such as Marsh, who has a fine ODI record but has not played an ODI for 14 months. Regardless, it cannot be ignored that Stoinis is failing to execute his role as a swift scorer in the middle order.